The Paddington Collective Blog is a collection of updates as to whats going on in our world from new products to brilliant photographs. These reconditioned Gabrielle Bears are in exceptional condition, they are sporting hand crafted replacement hat, coat, boots and sport a beautiful fully licenced soft leather ‘please look after this bear’ swing tag. No moth holes, no fusty smells and a tag that can’t be ripped by the tiny hands of an excited bear enthusiast. Paddington 2 -Botanic Gardens, Melbourne. Paddington 2 finally made its way across the pond. Bravo!! A simply wonderful film. If you haven’t seen it yet... grab a marmalade sanger and head for the nearest cinema. You didn't even know you wanted one, but then a weird sale happened and you were told you needed one...so, you bought one. Well at least you got a good deal. Our official replica soft leather 'look after this Bear' tags and smart Paddington luggage labels are reduced in the great Black Marmalade mark down Friday and until Christmas sale now on. We simply can’t get enough of the new M&S Christmas advert featuring our favourite marmalade muncher. Paddington 2, the first review is in and it’s a belter, now I can’t wait. The death of sir Michael Bond brought a great sadness to PB fans across the globe this week. R.W Alley sketched this beautiful tribute illustration in loving memory of our furry friends creator. Many will have seen the very sad news this morning that Michael Bond, creator of our beloved Paddington Bear, sadly passed away yesterday at his home aged 91. Michael was a BBC cameraman and part time writer when one Christmas Eve he bought a small soft toy bear that was sitting all alone on a shelf in a department store. He gave it to his wife as a Christmas present and a little while later, when wondering what to write about, he noticed the bear and began to write a story about what being a bear in a human world would be like. He called the bear Paddington after the station near where he was living at the time. 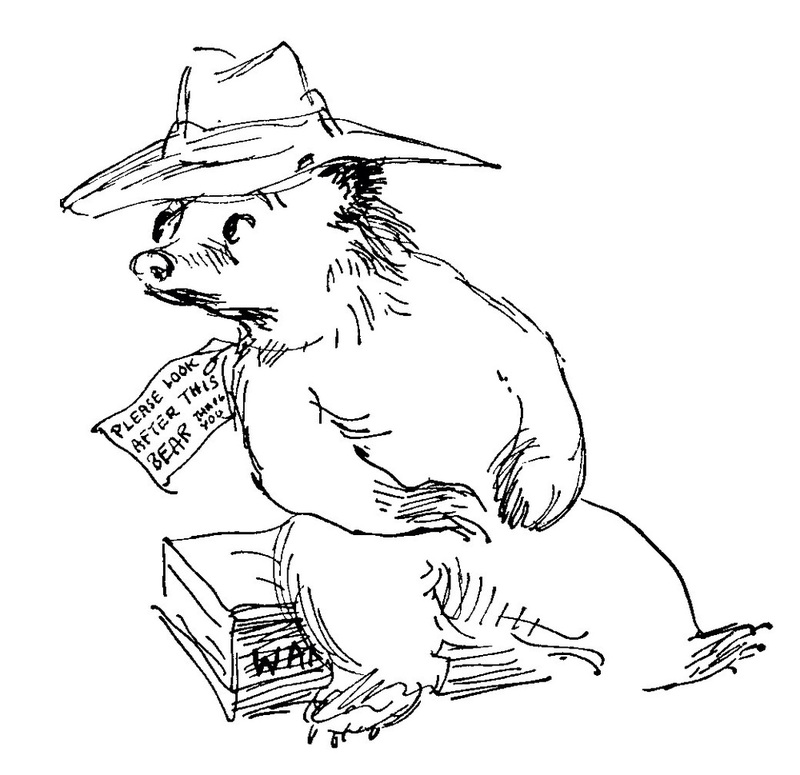 ‘A Bear Called Paddington’ was first published by William Collins and Sons in 1958 and has never been out of print since. With Michael’s careful guidance Paddington made the transition to television in 1975 and a merchandising programme launched in the same decade. More recently Paddington featured in a highly acclaimed feature film and its sequel Paddington 2 is due to be released by Studiocanal in November this year. Michael was the most modest and nicest of people and, like Paddington, very polite with a clear sense of right and wrong and a gentle sense of humour. He will be greatly missed by all at Copyrights who have represented the merchandising of his wonderful creation since 1982. Our thoughts are with Michael's family from all of us here at The Paddington Collective. Paddington Bear's swing tag - a little history. Michael Bond suggested that the 'thank you' be added to the design. Since the Gabrielle Designs Bears of the 1970's and 80's many versions have of Paddington have been produced and the design of the swing tag has returned to Fortnums fabulous original imagining. In the recent Paddington movie we see Aunt Lucy lovingly giving our hero his tag which ensures that the Browns eventually take him in. The swing tag is such a big part of Paddington's overall look, but all too often the original tag has become battered or lost. You can replace your bear's tag with this official exclusive leather replica from The Paddington Collective. It Looks very much like the little Rainbow Designs guy beat his fellow Paddingtons to the Easter bounty. Holidays? Look at these two furry guys with their fancy luggage label? Available from www.thepaddingtoncollective.com this wonderful replica Paddington luggage label. Comes with a fold out compartment for your details. Lots and Lots of new stock at The Paddington Collective. Adding to the OBE he received in 1997, Paddington's creator will be awarded the CBE in the Queens birthday honours list and The Paddington Collective is thrilled with the news. When Shirley Clarkson presented Paddington creator Michael Bond with the original Bears, it was at his request that 'Thank You' was added to the luggage label. 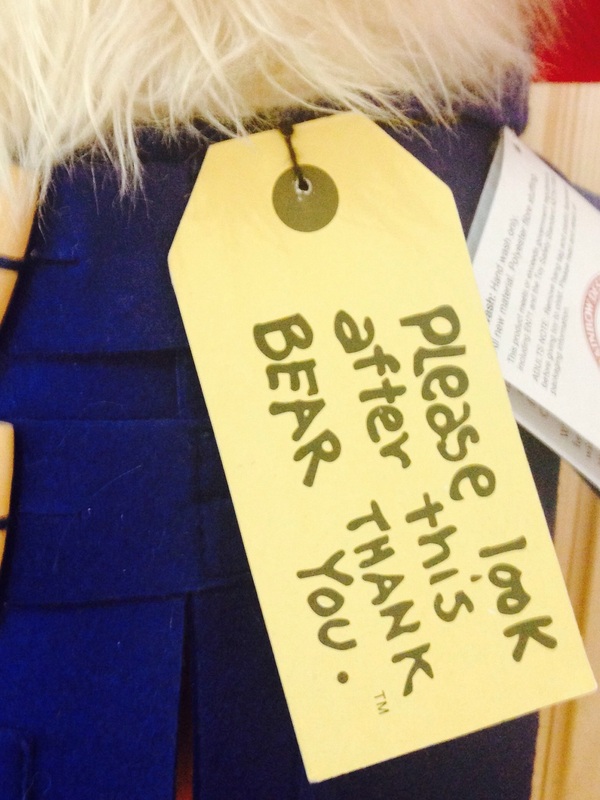 So you will find on the very early Gabrielle Designs Paddington swing tags it simply reads 'Please look after this Bear'. The message was written by his dear Aunt Lucy and, as we all know she was very polite. We think this a very appropriate addition. 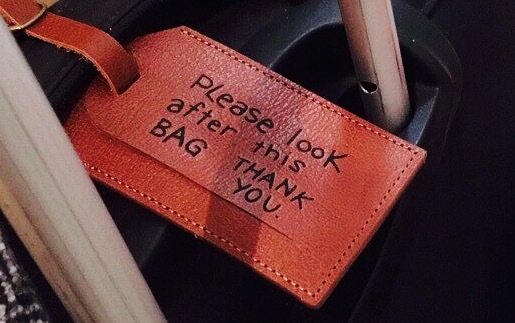 A rare luggage swing tag minus the politeness. The 2015 Empire Awards are next week and the utterly marvellous Paddington Movie is up for 2 awards. You can cast your votes here.